The Pininfarina Enjoy, inspired by the concept car of the same name had its world debut at the British Louis Vuitton Classic, on 5 June 2004 at Waddesdon Manor (Waddesdon, Great Britain). This is a dream come true, even if just for the lucky few. 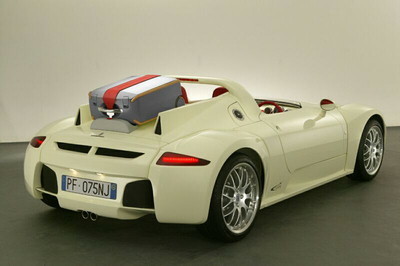 Because Pininfarina intends to weigh, through a promotional tour, the interest of collectors and enthusiasts towards a special car which is supposed to be manufactured and sold in only 75 units during 2005 to celebrate the companys 75th anniversary. And thanks to the Enjoy Pininfarina has started up a new prestigious partnership with the most important luxury brand in the world, Louis Vuitton, which was commissioned to work on the interiors of the vehicle. The Enjoy, Pininfarina branded, is an ambitious project: the idea of building an exclusive car with a production run of less than a 100, with top design, technical features and performance, combined with detailed craftsmanship, represents an equation that no other manufacturer has managed to pull off. Thanks to the recent acquisition of the engineering, testing and prototyping divisions of Matra Automobile, which has a tried and tested culture in terms of mechanical work, Pininfarina has been able to extend its areas of expertise and become a genuine car manufacturer, turning the Enjoy into an exclusive and innovative product. In order to underline the internationalization of the group, the style as well as the engineering development of the exterior have been performed in Turin, while the interior development has been carried out by the technical staff of Matra Automobile Engineering. The possible production is planned in Matras prototyping workshop and final delivery for the lucky few will take place at CERAM, another company of the Pininfarina Group. Thanks to the newly acquired technical competencies a further premier has been achieved with the chassis and suspensions development by Matra. The technical solutions are traditional but some of the features are directly derived from the competitions like the front suspensions preloaded and the shock-absorbers dual setting. This car thus represents the living, functioning proof that Pininfarina is able to offer the big manufacturers a full service, from styling to design to niche production. But what is the Pininfarina Enjoy? The definitive driving experience. Driving pleasure in its purest form. Pininfarinas exclusive, modern interpretation of that most classic and appealing category, the barchetta, which turns into an open wheel race car at the drop of a hat. What makes the Enjoy unique is, on one hand, the limited edition, numbered, production run, reserved for an elite clientele of collectors and enthusiasts with a genuine passion for cars, a sensual rapport with them, and a true appreciation of the value of exclusivity and tradition; on the other hand, its interiors by Louis Vuitton. The groups involvement in the Enjoy project represented the continuation of the long tradition which links Louis Vuitton to the motoring world, dating back to 1907, when twins Jean and Pierre Vuitton built their first car. The radical design features of the Enjoy, like the elimination of the windscreen, highlight the way that style guided the project, the sole aims of which were to obtain the utmost in aesthetic quality and driving pleasure, without compromise. Thanks to an original technical solution, the wings can be dismounted and removed, transforming the Enjoy into an extreme open wheel roadster. The Enjoy has a lightweight aluminium chassis and its body is entirely made out of carbon fibre. The aim to create the ultimate driving experience led to the creation of a very light vehicle (the track version weighs less than 800 kg) with an outstanding weight/power ratio of 4.3 kg/bhp. The new double wishbone front and rear suspensions by Matra mean track level driving precision in all conditions. The top speed is around 250 km/h, while acceleration (from 0 to 100 km/h in 5.2 seconds) and road holding are the cars key strengths. STYLING The bodywork in carbon fibre has a central body with an elliptical shape and a wedge-like ridge along the side. The sizeable air inlet at the front meets the slim bumpers above and a wing-shaped element below, which with the wheels uncovered creates a full-width spoiler. At the centre of the front bonnet a broad scoop hides the opening for the radiator air vent, while the lights are built into a transparent longitudinal band which highlights the separation between bonnet and mudguards. Four geometrical elements function as removable mudguards which give the vehicle a totally original look, and once removed, highlight technical features typical of the motor biking world, where mechanical elements are a key part of design. Behind the seats, a roll bar links two domes tapering off into fins which act as air extractors. A luggage rack can be positioned at the centre of the engine housing. The rear of the car features two wide openings for heat exchange and two central exhausts. The layout of the tail lights repeat that of the front lights, to underline the width of the car. INTERIOR DESIGN BY LOUIS VITTON Designing the interiors of the Pininfarina Enjoy was all about creating a look dedicated to pure sporting pleasure in a car. 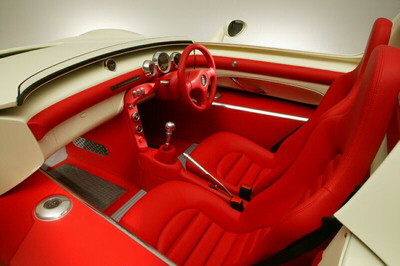 Starting from the 2003 concept, Louis Vuittons innovation division redefined the ergonomics, instruments and accessories to enhance driving pleasure in its most primitive form, typical of a sports car, while keeping its distance from the radicalism of the classic British cabriolet, which is often a little too spartan and bare in terms of materials and instrument array. This being an open car, the materials chosen featured a combination of non-tanned chrome-coloured leather and weather-proof neoprene textiles, which lend a sporty but luxurious feel. And because the Enjoy has neither a roof nor a windscreen, the company came up with a protective helmet. Louis Vuitton has been familiar with this accessory since its first model was launched in 1988. The Enjoy helmet, which takes its colours from the car, features the Louis Vuitton Classic emblem and has two great innovations: a double structure which serves to protect the visor, which slides between two shells, and to conceal generous air vents, which enhance comfort; an original system of trims for the areas of contact, which enhances protection: a pair of sunglasses which fit the helmet perfectly. Driving a race car also requires the right clothing. Louis Vuitton developed two driving suits, in mens and womens versions, in leather and neoprene in the colours of the car, with protection on the shoulders, hips and knees for greater comfort and to cling better to the seats. The Footwear Division also designed a pair of car shoes for city use, inspired by Louis Vuitton classic colours, graphic motifs and materials. Just as in all high performance sports cars, every millimetre of space in the Enjoy is exploited to the max: with no boot the new Bellaix trolley suitcase (medium-sized model) can be positioned on the rear bonnet. This composite-material luggage offers full guarantees in terms of durability and capacity, meaning that users can safely entrust their belongings to it. 2004-06-07 Please quote Autoindex.org if You use this news article!